Cilla Black, or as we like to call her, the lovely Cilla Black, regularly graced our TV screens for many years, and represents different things to different people depending on what moment of her ridiculously long career you happened to tune in on with the goggle box. Network Distributing take us back to a time that sits before Surprise Surprise and Blind Date, but after the heady heights of her pop career, to two series that showcased the legendary Liverpudlian's comedy talents. 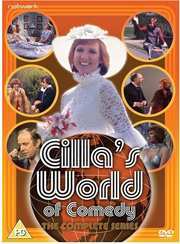 Out on 7th October are two titles, Cilla's Comedy Six and Cilla's World of Comedy, each with a runtime of 150 minutes approximately, and recommended retail price of £12.99. Thankfully both are presented in their original full frame. 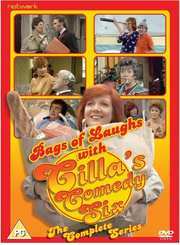 Originally screened in 1975, Cilla’s Comedy Six sees Cilla portrays a range of female roles from Mrs Average Housewife to round-the-world yatchswoman, woman caring for her widowed father and a temp fending off the amourous advances of her latest boss. Cilla’s World of Comedy sees Cilla in a set of bittersweet dramas focussing on the trials and tribulations of six modern women with very different lives, including a footballer’s wife, a woman hoping to escape her past in a new home, a biology teacher who is forced to take stock of her own life, and a bride-to-be making a torturous journey to the alter. Guest co-stars include Richard Wilson, Keith Barron, Frank Middlemass and James Hazeldine.